Jollibee gives amazing treats this summer. 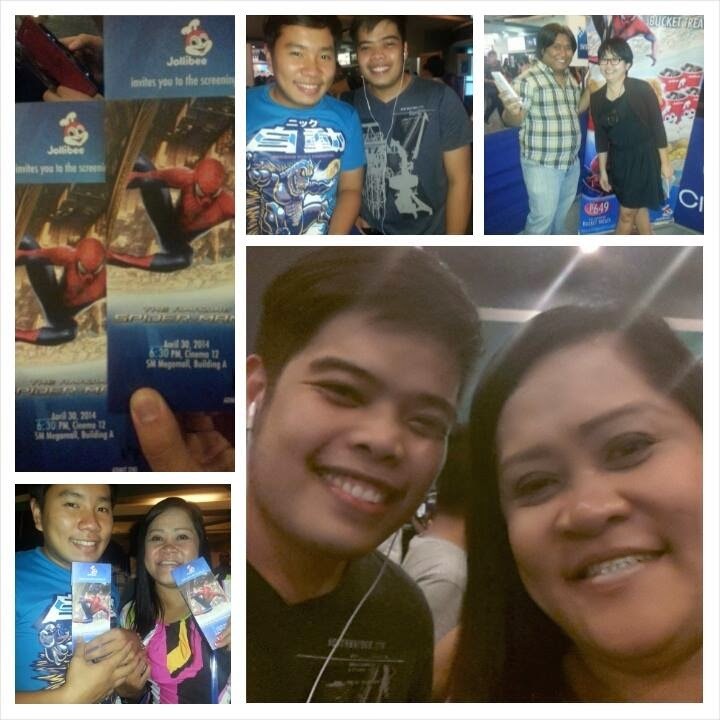 I was with my son watching The Amazing Spiderman 2 sponsored by Jollibee last night at SM Megamall Cinema 12 witnessing the amazing twists and new villains of the famous Marvel sequel. Before the screening, we accidentally bumped into my cousin Alvin who was also watching the same movie in another cinema with his friends. Jollibee's pre-Labor Day celebration with the famous Marvel superhero was made even more special with Jollibee Amazing Treats. Now they have new Jollibee Amazing Bucket Treats with ChickenJoy, 4 glasses of softdrinks, mashed potatoes and corn plus their delicious Kitkat Mix-ins for only Php649. 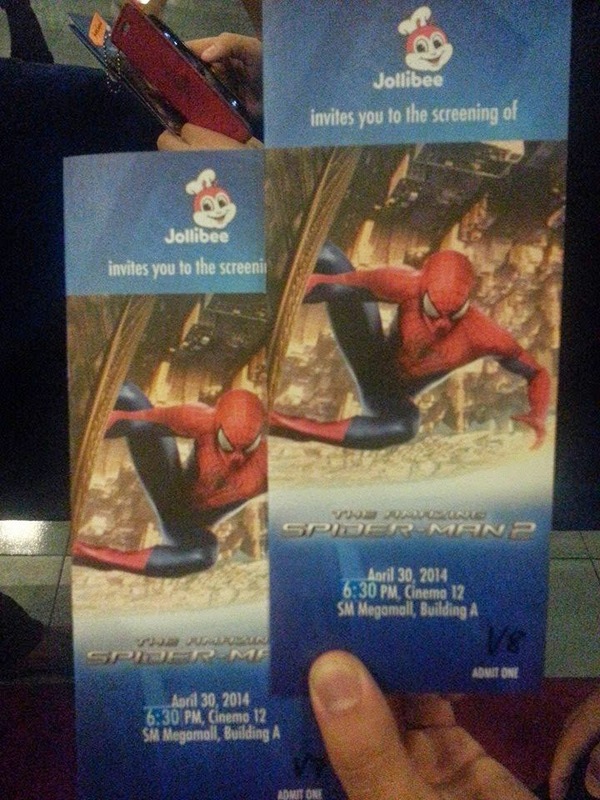 You can also avail of The Amazing Spiderman 2 Image Appearing Tumbler upon purchase of Burger Value Meal for only Php60. 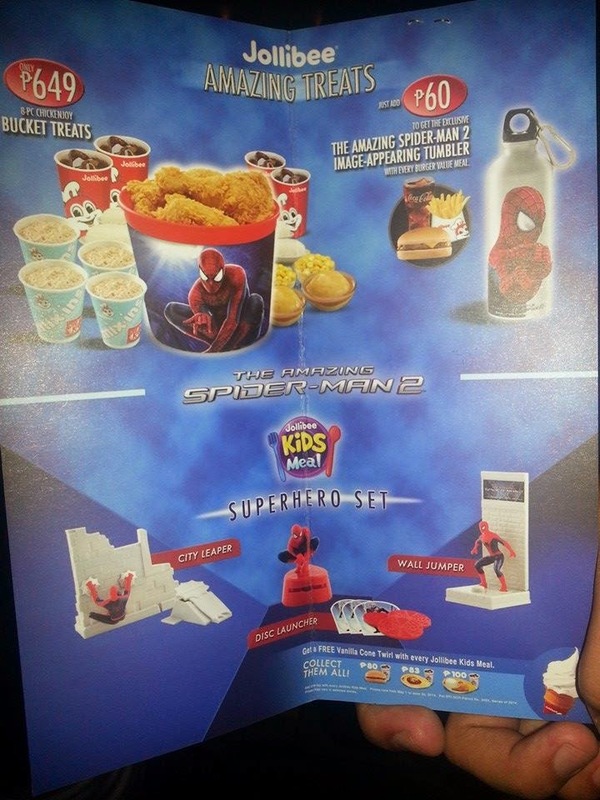 The family will also get the kids smile and be happy with Jollibee's Kiddie Meal with The Amazing Spiderman 2 Superhero Set. Warning: Spoilers below so don't read further if you plan to watch. This second sequel of The Amazing Spiderman with Andrew Garfield is rated PG because of graphic and violent scenes the kids may not be suitable to watch. I loved the animation and the experience of flying with Spiderman in this film unlike any other adaptation of this superhero. The lines of Emma Stone as Gwen Stacy and Andrew Garfield as Peter Parker/Spiderman were beyond my expectations. This Spiderman movie never hid the person behind the mask and it was too romantic, you'll fall in love with Gwen especially when she delivers her valedictory speech. This Spiderman is also getting close to reality with the death of Gwen and the believable reason why the nanotechnology healing powers of spiders can only work with the DNA of Spiderman. I cried at the scenes when his father left a video message. I wanted to hug Peter Parker twice, once with his father's video message and next when he finally viewed Gwen's valedictory speech on his computer. I also wanted to hug Max Dillon/Electro for being unrecognized despite his talents and efforts. Many of my students feel the same way soul-searching all their lives to feel normal. The movie left a lasting inspiration to all - keep going and keep hope alive. It's the reason why Peter Parker fell in love with Gwen and it's the reason also why he should keep going. Sometimes, you need to be alone to face the world because everyone else is busy with their own role in the society. I loved the movie and I will definitely share this to all my students and friends. Thank you Jollibee! For deliveries, call 8-7000, visit www.jollibeedelivery.com for online delivery and like https://www.facebook.com/JollibeePhilippines. Follow @jollibee on Instagram and @iwantJollibee on Twitter for more promos and updates.